Air Source Heat Pumps | Pak Plant Ltd.
LZT – High efficiency air source heat pumps with E.V.I. compressors with Heating Capacities from 10 to 200 kw. 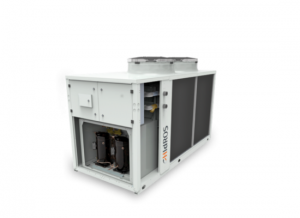 The LZT series of high efficiency heat pumps have been specifically designed for use with radiant floor heating systems or those applications where it is necessary to have maximum efficiency when heating. They have been optimized on heating mode, are able to produce water up to 65°C and can operate down to -20°C ambient temperature. LZT units are available in 2 pipes, 2+2 pipes and 4 pipes versions. Some versions can produce domestic hot water, in the P2S version through the activation of an external 3-way-valve and in the P4S version by means of a separate heat exchanger and hydraulic circuit for the domestic hot water. The LHA series of high efficiency heat pumps has been specifically designed for use with radiant floor heating systems or those applications where it is necessary to have maximum efficiency when heating. They have been optimized on heating mode, are able to produce water up to 60°C and can operate down to -20°C ambient temperature. LHA units are available in 2 pipe, 2+2 pipe and 4 pipe versions. All versions are supplied with reverse cycle valve used for winter defrost; the HH version is suitable for use in those countries that have support schemes for use of heat pump technology for heating. The RV versions are also able to produce cold water. The HH heating only versions is factory set and locked to operate only in heating mode whilst. The noise is extremely low thanks to the use of a special floating vibration damping system which allows a noise reduction of about 10-12 dB(A) (Optional).